The Chernobyl disaster  was a nuclear disaster which occurred on 26 April 1986 at the Chernobyl nuclear power plant in Pripyat, Ukraine. At that time, Ukraine was part of the Soviet Union. The event was the worst accident in the history of nuclear power. Because the RBMK reactors used at the plant had no containment building to keep the radiation in, radioactive fallout drifted over parts of the western Soviet Union, Eastern Europe, Scandinavia, the UK, and the eastern United States. 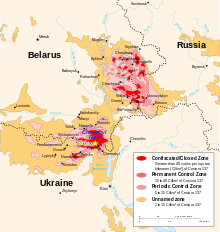 Large areas of Ukraine, Belarus, and Russia were badly contaminated. About 60% of the radioactive fallout landed in Belarus. About 360,000 people needed to be moved to other places, where they could live after the accident. Before the accident, there was a planned power reduction. By the beginning of the day shift, the power level had reached 50%. Following this, randomly, one of the regional power stations went offline. It was then requested that the further power reduction would be postponed. Despite this request, the reduction and preparations for a test that was to happen continued. The accident occurred when the fourth reactor suffered a huge power increase. This led to the core of the reactor exploding. Due to this explosion, large amounts of radioactive materials and fuel were released. This caused the neutron moderator, made of graphite, to start to burn. The fire caused more radioactive fallout to be released, which was carried by the smoke of the fire into the environment. The accident raised concerns about the safety of the Soviet nuclear power industry. The Soviet Union slowed down the process of making its nuclear industry bigger for some time. The Soviet government also had to become less secretive as a result of the accident. Since then, Russia, Ukraine and Belarus have become separate countries. Those countries have been burdened with continuing costs for decontamination (removing the radiation) and health care because of the accident. Exposure to radiation leads to a higher risk of getting cancer, a deadly disease. It is difficult to accurately tell the number of deaths caused by the events at Chernobyl. The Chernobyl accident happened when some workers were testing the safety of the reactor. Some of the devices that stopped the reactor from exploding were switched off. Then, there was a power surge; the reactor fell out of control and exploded. Most of the people affected have not died yet. When and if the people involved die of cancer, or related diseases, it will be hard to tell if this was because of the accident. A 2005 IAEA report tells of 56 direct deaths; of those, 47 were accident workers and 9 were children who died of thyroid cancer. The report thinks that up to 4,000 people may die from long term diseases related to the accident. Greenpeace, along with others, thinks that the study's conclusions may not be true. ↑ Environmental consequences of the Chernobyl accident and their remediation: Twenty years of experience. Report of the Chernobyl Forum Expert Group ‘Environment’ (PDF). Vienna: International Atomic Energy Agency. 2006. p. 180. ISBN 92–0–114705–8 Check |isbn= value: invalid character (help). Retrieved 13 March 2011. ↑ "Table 2.2 Number of people affected by the Chernobyl accident (to December 2000)" (PDF). The Human Consequences of the Chernobyl Nuclear Accident. UNDP and UNICEF. 22 January 2002. p. 32. Retrieved 17 September 2010. ↑ "Table 5.3: Evacuated and resettled people" (PDF). The Human Consequences of the Chernobyl Nuclear Accident. UNDP and UNICEF. 22 January 2002. p. 66. Retrieved 17 September 2010. ↑ "As 30th anniversary of Chernobyl nears, giant arch set to encase radiation for next 100 years". The Japan Times. 24 March 2016. Retrieved 27 March 2016. 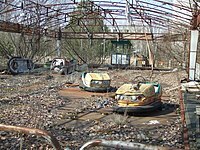 Wikimedia Commons has media related to Chernobyl disaster. This page was last changed on 2 April 2019, at 13:25.